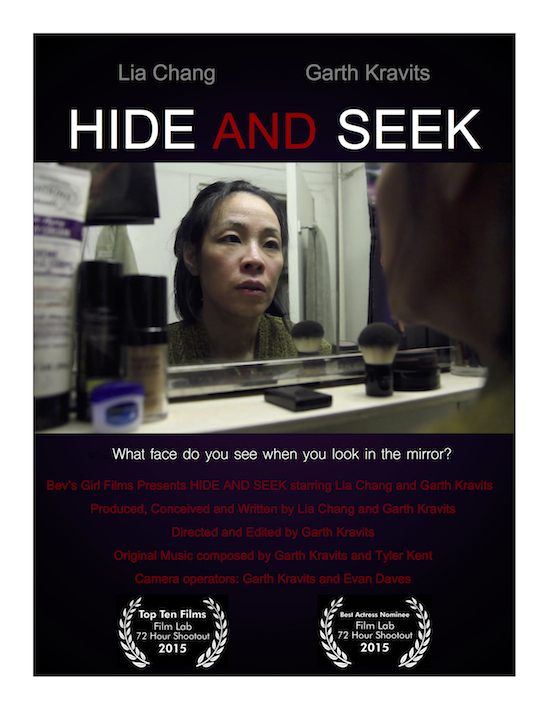 Hide and Seek, an award-winning short film by Lia Chang and Garth Kravits, speaks to the societal challenge that women, and especially women of color, endure every day. To look in the mirror and to hope to see a face other than your own. One that is closer to what magazines, television and movies define as beautiful or even normal. What face do you see when you look in the mirror? Lia Chang is an actor, a photographer, an award-winning multi-platform journalist and an award-winning filmmaker. She is the Arts and Entertainment Reporter for AsAmNews.com. Lia recently received a Best Actress, Asian American Film Lab 72 Hour Shootout of 2015 nomination for starring in her 1st indie short film, Hide and Seek, made with her producing partner Garth Kravits, and it was named among the top ten winning films. Lia has appeared in Wolf,New Jack City, A Kiss Before Dying, King of New York, Big Trouble in Little China, The Last Dragon,Taxman, “As the World Turns,” “One Life to Live” and “New York Undercover”. Chang has hosted the series “Film Lab Presents”. Lia is a National Tropical Botanical Garden Environmental Journalism Fellow, a Scripps Howard New Media Fellow at Columbia’s Graduate School of Journalism, a Visual Journalism Fellow at the Poynter Institute for New Media and a Western Knight Fellow at USC’s Annenberg College of Communications for Specialized Journalism on Entertainment Journalism in the Digital Age. She is the recipient of the Asian American Journalists Association 2001 National Award for New Media and the Organization of Chinese Americans 2000 Chinese American Journalist Award. Avenue Magazine named her one of the “One Hundred Most Influential Asian Americans” in 1997. She is featured in Joann Faung Jean Lee’s book “Asian American actors: oral histories from stage, screen, and television”.